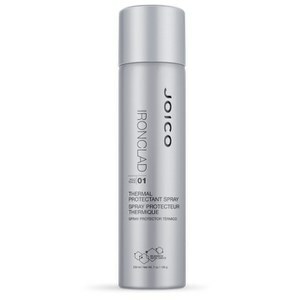 Banish frizz and static for up to 72 hours with the Ironclad Thermal Protectant Spray from Joico. Deep-sea antioxidant AquaLastik is activated by heat and light to shield against styling tools up to 230°C, whilst its innovative Bio-Advanced Peptide Complex imparts luminous shine to leave you with camera ready, luscious locks. Forming a protective barrier between heat and hair to leave you with super sleek, smooth locks, the spray is perfect for all hair types, especially frizz-prone. Non-greasy and ultra-lightweight, the mist delivers flexible hold and strengthens hair from root to tip. E.N. Hold the can 8-10 inches from hair and spritz hair liberally before any exposure to heat styling – including sessions with your flat iron, curling wand, or blow dryer.